There maybe a number of reasons that you want to monitor yours or someone else's PC. With the help of computer monitoring software (otherwise known as keyloggers) you can view all activity undertaken on the target machine, including everything typed and every website visited. Installing computer monitoring software could be the solution in a number of situations; from catching a cheating spouse, to acquiring a password to someone's account on a certain website, to simply keeping an eye on the family PC. Whatever the reason, computer monitoring software can help. 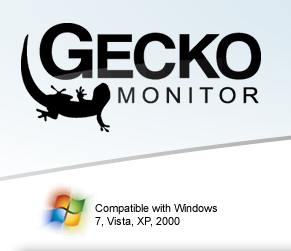 Gecko Monitor can be downloaded and installed in a matter of minutes. Once installed the software runs completely silently, with no signs of it in the task manager, start menu, add/remove programs list or program files directory. In fact the installation is hidden so well even the most tech savy of users will not be able to find it. Periodic screenshots of either active window or entire screen. All applications used and the time and date of use. All websites visited and the time and date of use. All keystrokes typed/pressed, including time and date. All files opened, saved, deleted or moved, including time and date. All documents printed, including time and date. Innovative Timeline feature, to see a snapshot of events. Gecko Monitor also has a few custom features, including quick uninstall from the interface, the ability to add websites or files for the program to ignore, and the ability to monitor all PC users when installed as the administrator. The good news is that hackatrick will giveaway 5 full version Gecko Monitor software for free to five lucky winner. For more details wait for the next post.